… Ok, I’ll admit it. I am not a huge football fan. I know some players, I know the rules, and I’ve watched a couple of games, but it’s just not my favorite sport. However, saying that, I understand that there are TONS of fans of the sport and this app attempts to be the biggest compilation of players and team information available. Did they succeed? 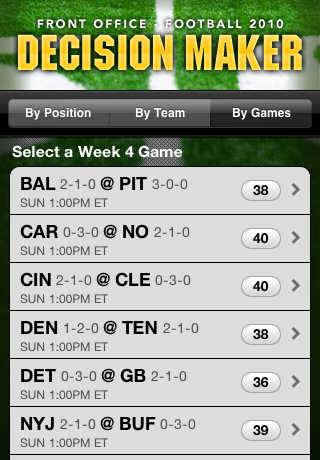 Decision Maker, released by Bloomberg LP, is available on the iPhone, iPod touch, and iPad for $1.99. 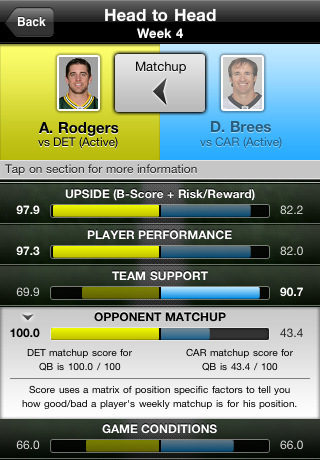 Alright, features: Search players through positions, team, or games; get information on each individual player for their performance, team support, opponent matchups, and game conditions (calculated through a matrix of position specific factors, weighted historical averages and projections, and many other calculations); and being able to compare two athletes on their stats. Technically, this app is nearly perfect. The app recognizes your touch accurately, there are no crashes, and there is little to no lag. With so many players in the NFL with all the different teams, this is quite an impressive feat. Player information however, is a bit sketchier. Decision Maker doesn’t really provide any real details on HOW they come up with the stats. They say they get this information from matrixes of position specific factors… but what are those factors? Whether these stats are facts or not can easily be questioned and it’s predictions on who has more potential is questionably abstract. This was made for the fantasy football players, but wouldn’t this and far more comprehensive information be available to fans of fantasy football lovers for free? On the internet? For the information available, I would say this is worth the money. For those of you who have played the fantasy football game for years now, however, this maybe just be telling you what you already know or what you have no need for. This one is up in the air, but on a purely technical level, Decision Maker is nearly perfect as a comprehensive listing of players and teams. AppSafari review of Decision Maker – Football ’10 was written by Joseph Ho on November 26th, 2010 and categorized under App Store, Reference, Sports, Utilities. Page viewed 6755 times, 3 so far today. Need help on using these apps? Please read the Help Page.